Today was all about color, sugar and speed. I love it. 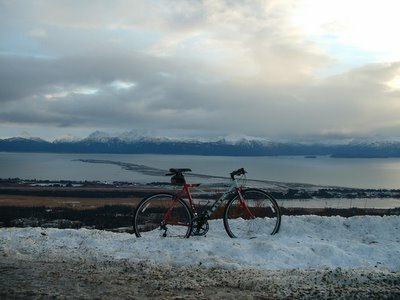 While the good folks down in Austin, Texas, are digging out of an ice storm, I'm pacing trucks on my road bike - in Alaska, in December. Sometimes, life turns upside down and smiles at you. No one at the office wanted to work today. The publisher announced yesterday that we were having a pot luck and *no one* was allowed to bring anything but desserts. Even the girl who brought in Fuji apples the size of small pumpkins was frowned upon. So we stuffed our faces with cookies, brownies, pistachio pie - then, bloated and reeling from sugar shock, we pulled down all the Christmas decorations and started throwing tinsel everywhere. At about 1:30 p.m. I looked outside and could see a hint of sun showing through the rain clouds. And I knew - just knew - a rare window had opened. 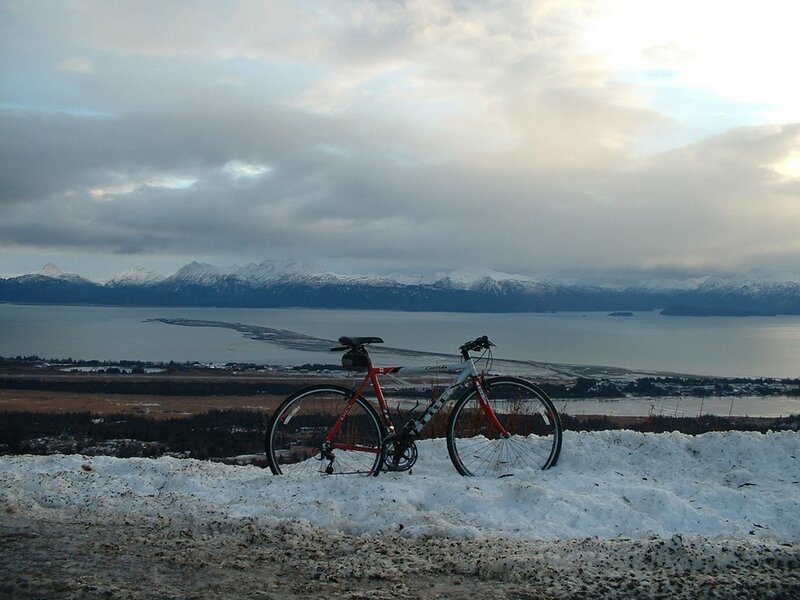 I arrived home at 2 p.m., unhooked my road bike from the trainer I thought it would sit upon for at least three more months, walked it along the precarious ice sheet that my driveway has become, and went for a ride - a fast ride. 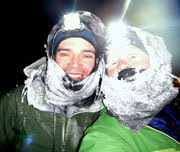 After a month on the mountain bike slogging through the snow, I was coasting along pavement and sucking in warm breeze like it was suddenly spring. Everywhere colors emerged that have spent so long buried in hoarfrost - deep greens and yellows reflecting off what was left of the snow, blue and orange in the sky. The headwind out of the west was fierce but I rode as hard as I could, and felt like I was flying. 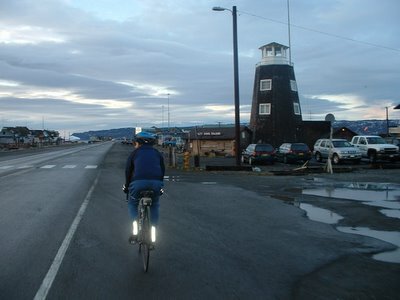 Geoff joined me for what turned out to be the last half of my ride - down the Spit and around Kachemak Drive, for 17 miles. By the time we returned, just after 4 p.m., the sun was long gone. The clearing sky signaled the cold will return. Alas, it's December, and there's nothing that will stop it. But - for a small window within winter's icy grip, I had a 32-mile road ride on a 40-degree afternoon and almost believed it was spring. Now Geoff and I are headed to Foreign Film Friday at the college, but I wanted to say thank you so much to Holly and Kris, who sponsored today's and Monday's ride and stoked my further excitement for the Susitna 100. It won't be anything like today, but with any luck, it'll feel even better to come home from. Thanks for stoppin by, my best man is in Anchorage. It is still cold here. 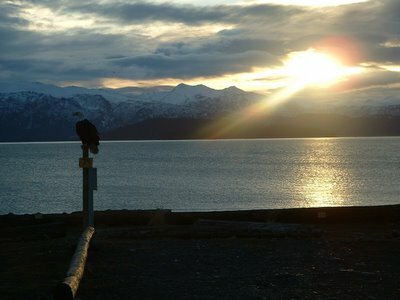 Homer is such a cool place. I remember seeing baby eagles flying on the beach the last time I was there, which completely awed me. Thanks for posting all of your gorgeous winter pictures. It may be frigid in Alaska, but winter is still incredibly beautiful sometimes.